The fourth of July is just a few days away, and I’ve been working hard on my holiday weekend menu. We just got back from a week long vacation, and I feel like I need a vacation from my vacation. It was so much fun, but because we are on a cruise, there was so much fun to be had, we forgot the rest and relaxation part. Hopefully we’ll be able to get a little rest in before the weekend comes. As for our holiday menu, I know I want to smoke some ribs. My favorite thing to do when we’re lounging around our backyard is to have some pork smoking. The smell is just intoxicating. I also want to make some simple sides like fresh grilled corn and probably some grilled fruit and veggie kabobs. But tot start things off, I’m going to make these Berry Bellinis for my guests. These are so simple to make. I just used a bottle of Smirnoff ICE Original mixed with some frozen mixed berries. For extra flavor, you could also add a shot of a raspberry or blueberry schnapps. Then just simply blend the ingredients on high in the blender and serve with fresh fruit. 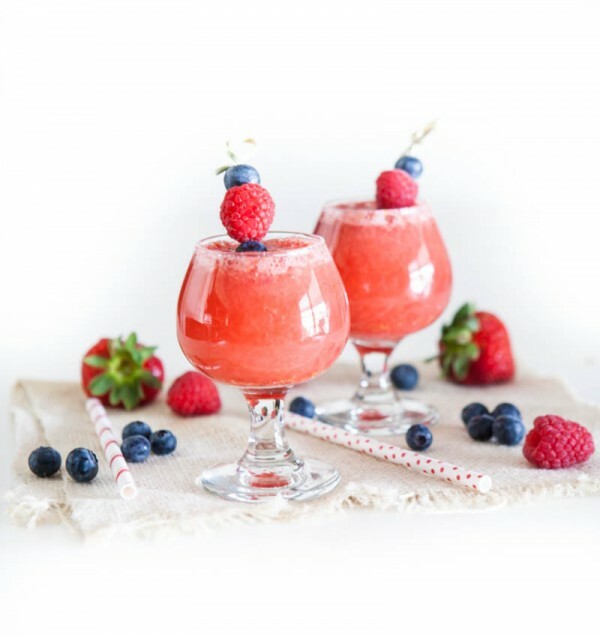 This is a great cocktail to make for the fourth of July, or any summer cookout. It’s light and refreshing and can also easily be made for the little ones by replacing the Smirnoff Ice with sparkling water. 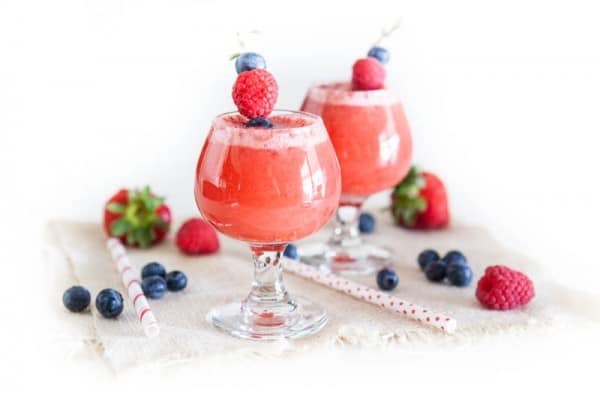 Combine Smirnoff ICE Original and frozen berries in a blender. Mix on high until well-combined. Garnish with fresh fruit before serving. Smirnoff Ice celebrates the absurdly awesome. These sound like the perfect summer drink! beautiful presentation and photos! Love those skewers with the berries. These look berry delicious! Seriously – I think I need these for the weekend. Can’t wait to try it! Mmmmm…. anything with berries is a YES for me! Any cocktail full of berries is a-okay with me! Looks refreshing and delicious. This looks like the perfect summer drink! LOVE it! I know what you mean about needing a vacation from the vacation! This looks beautiful! I have never had a bellini. This looks beautiful. 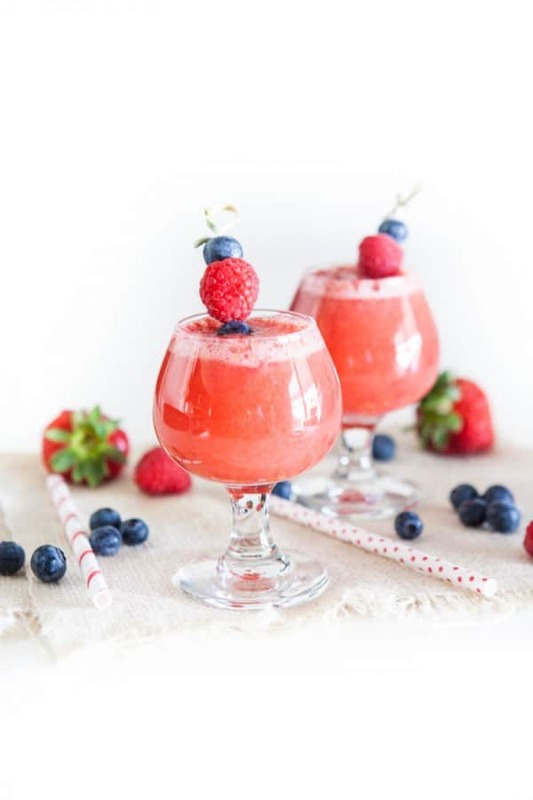 Berries in drinks are absolutely perfect for the summer! Smirnoff was one of the first drinks I ever had haha. Love this bellini! Sounds perfectly refreshing for the long weekend and this hot weather! Love cocktails that use a bunch of fruit! I SO could have went for a couple of these today with it being 98 degrees and all! Mmmm! So pretty and they look refreshing! Oh, I am soooo down with this! So refreshing and pretty! And there’s vodka, so, yea… I’m in there.